Oh hey! I'm back after a relaxing and fun weekend since I'm feeling better after my wisdom teeth removal. I'm not going to lie, things seem to be spinning out of control between preparing to head back to school, a second beach trip, work and my side job as a tennis coach. Although I shouldn't complain because I'm so thankful for all of the opportunities I have coming my way. I can't believe how HOT it's getting, a second heat wave is definitely hitting the East Coast right now so I have lots of sleeveless tanks and printed shorts and skirts ready to wear for the rest of the summer. I'm also loading up on cute, retro-inspired sunnies for a cool look. Lately I can't get enough of mixing and matching modern and vintage pieces. By the way, I bought these wedges yesterday and I seriously am obsessed. They are probably the comfiest wedges I own and they were on sale for only $25 from $100, win and win. Nice steal on the shoes - they are super cute. Can't lie, I'm in the Pacific Northwest this summer and I totally miss the sweaty, humid days of the east coast. LOVE this outfit and great pics! Just stopping by to let you know I have awarded you the Veratile Blogger Award on my blog (: Congrats! Love those shorts on you. You look fantastic! Not only are those wedges a steal and comfy, but they also look totally amazing! I love retro-style shoes more than anything (except retro style clothes haha). Love the sunnies too...you just look so laid back glam. 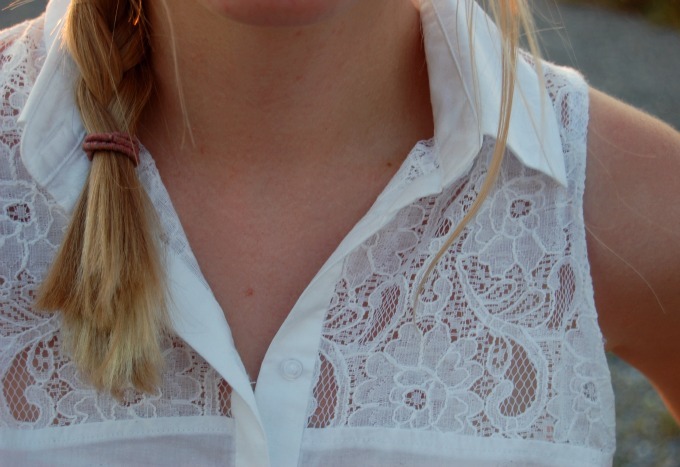 beautiful shirt, love lacy detailing! lovely pics as always. Oooh girl, look at that lighting! ;) It adds such a southern vibe to your pictures. I love it! Such a nice warm glow. That lace is beauuutiful~ and it provides such a nice medium of contrast against those bright red shorts. Digging your cat-eye shades as well! I'm feeling you with the heat though. It's getting difficult to plan out outfit posts when you only have so many different comfortable things to wear in the heat! The right time of the day for a photo shoot! Love the pics and the outfit! Cute shorts! Love the shoes too - great find! Hang in there...you'll get everything done! These photos are absolutely stunning, the lighting is to die for. The shirt is gorgeous too, the lace detailing is perfection. 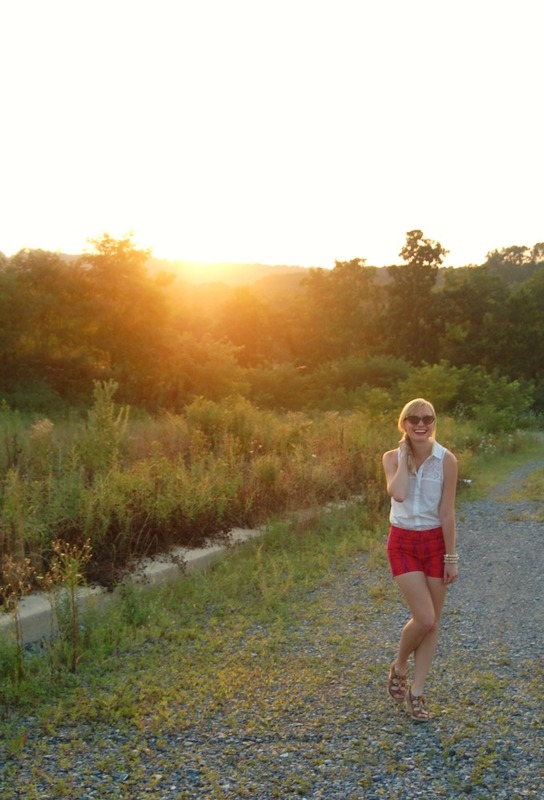 You have such a very lovely blog....this is surely a win-win outfit, so casually chic! what a great look! love the top! Hahaha thats an awesome deal:) I got my homecoming shoes this year on sale for $5 from $65! You look absolutely gorgeous by the way, the lighting is just amazing! Lookin' lovely as usual! Those shorts are super cute. You look supper cute. Love the Eye wear ! You look so cute! I love the top and shorts together. That lace detail on the top is adorable. Very lovely shorts! You look adorable! Those wedges are a great score, Chelsea:) And yes....this heat wave....ugh! Absolutely gorgeous wedges, I love them and want to stalk down a pair! I love your style! This outfit is beautiful! That blouse is adorable, very cute combo the short, amazing colors! Very cute sandals aswell... you look gorgeous! 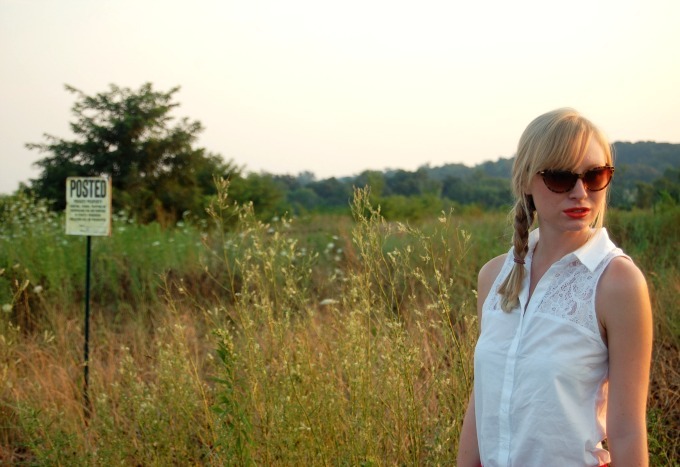 I've been sneaking around your blog & I LOVE it! Your style is awesome! You wear the most amazing clothes! Very inspirational! I'm following you from now! Would be lovely if you would visit me aswell..if you like! Have a lovely Sunday! Adorable! I love your shorts!